14/5/11 – Art market – Paris – An exceptional object will come up for auction at Sotheby’s Paris on 17 May. 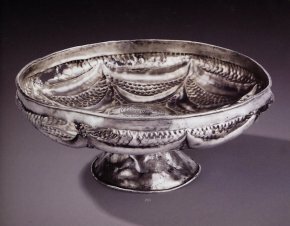 This bowl (hanap), in hand-tooled silver which can be dated back to around 1180 (ill. 1) is a unique piece. 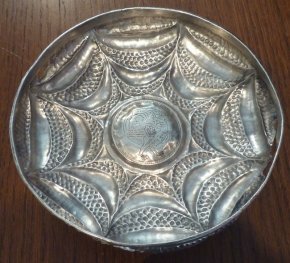 There are no private collections or museums holding such an old object. Its date of production can be deducted from the iconography, found also on ceramics, illuminations or column capitals. It represents (ill. 2) an eight-pointed star and forms in the shape of a crescent moon which represent cosmic symbols. The small hollowed points can be interpreted as pomegranate seeds placed on the branches of the star, symbolizing fertility. In the middle, a basilisk, half rooster, half serpent or dragon, is biting its tail. The person drinking was thus discouraged from emptying the contents so as not to reveal the diabolical animal. This hanap, surprisingly light when held, is undoubtedly a major work. It has not however been listed as a national treasure. According to our sources, this can be explained by the fact that there are no documented records of its history, since museums do not wish to take the risk of purchasing it directly from a private individual. The export permit will therefore allow the market to establish its own fair price but we would hope that this object does not leave the country and that it may perhaps be preempted. 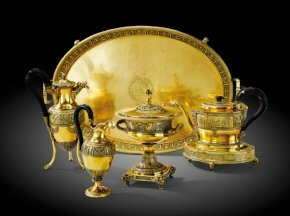 We also point out that this silver auction at Sotheby’s offers some other remarkable pieces, including an important tea and coffee set in vermeil by Martin-Guillaume Biennais  (ill. 3). The public exhibition takes place on Friday 13, Saturday 14 and Monday 16 May from 10 am to 6 pm at 76 rue du Faubourg Saint-Honoré, 75008 Paris.